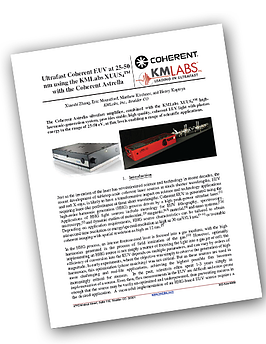 The Coherent Astrella® ultrafast amplifier, combined with the KMLabs XUUS high-harmonic-generation system, provides stable, high quality, coherent EUV light with photon energy in the range of 25-50 eV, at flux levels enabling a range of scientific applications. The XUUS system is the culmination more than 20 years of work by the Kapteyn/Murnane group at the University of Colorado, whose group pioneered 1) the development of ultrafast laser amplifier systems generating 20-30 fs pulses, 2) studies exploring the basic physics of the high harmonic generation process, and 3) experimental approaches for making use of HHG light in the most demanding applications such as high-fidelity EUV imaging. The test results summarized above provide users of the Coherent Astrella® a solid basis for what to expect when using their laser with the KMLabs XUUS4.